Dogs and cats are covered in fur, so it’s impossible for them to get sunburned or develop other sun-related problems like skin cancer, right? Actually, nothing could be further from the truth. Both dogs and cats can develop skin cancer. Although our pets’ dense fur acts as a natural sunscreen, it isn’t uniformly dense. Body areas with thin or no fur — such as the nose, ears, around the eyes and, for many dogs, their bellies — are vulnerable to sun exposure and damage. Dogs and cats with white or light-colored coats and chronic sun exposure are also at greater risk for skin problems. The skin is one of the largest organ systems of dogs and cats, and it’s certainly one of the most visible. Lumps and bumps can be fairly common, especially in senior pets. The good news is that skin growths, or tumors, are not always cancerous (malignant). In fact, approximately 60 to 80 percent of canine skin tumors are benign, meaning there’s a good chance that a lump or growth on your dog won’t be anything serious to worry about. For cats, however, about 50 to 65 percent of skin tumors are likely to be malignant. Unfortunately, you — and even your veterinarian — can’t tell if a tumor is one of the dangerous types simply by looking at it. That’s why you’ll want your veterinarian to evaluate any lump, bump or suspicious growth you find on your dog or cat’s skin. Just as people can develop different types of skin growths and cancers, so can dogs and cats. Three of the most common types of potentially cancerous skin tumors in dogs are melanoma, mast cell tumor and squamous cell carcinoma. For cats, the three most common forms of potentially malignant skin tumors include basal cell tumor, squamous cell carcinoma and mast cell tumor. Melanoma. Melanomas, which can be either benign or malignant growths, affect pigmented skin cells called melanocytes. The benign form tends to be found on areas of a dog’s body that have hair. Most cancerous melanomas occur on the mouth or mucous membranes, although about 10 percent are found on fur-covered body parts. Malignant melanomas tend to grow rapidly and are likely to spread to other organs, including the liver and lungs. Basal cell tumor. These tumors, which can be harmless or cancerous, account for 15 to 26 percent of all skin tumors in cats. Basal cell tumors vary in size, tend to be slow growing, and often appear as a single, well-defined, hairless, raised bump on the skin. They’re typically found on a cat’s head, neck or shoulders. Mast cell tumor (MCT). Mast cells are a type of white blood cell that is part of the immune system. These cells, which contain packets of histamine and heparin, are best known for their role in allergies and inflammation, although they play other important protective roles. Mast cell tumors are the most common malignant skin tumor of dogs, accounting for 7 to 21 percent of all canine skin tumors. MCTs can vary in appearance from a hair-covered lump on or under the skin to a hairless, red, open sore. They are also invasive and difficult to treat. In cats, MCTs can develop in the skin or in internal organs, most commonly the spleen, intestine and liver. Squamous cell carcinoma (SCC). Associated with sun exposure, squamous cell carcinomas are more commonly seen in cats than in dogs. White-furred areas of the face are at risk, with the ear tips and nose being especially vulnerable. The SCC typically begins as a small scabby area that may be mistaken for a scrape or cut. However, the “abrasion” doesn’t heal and actually continues to grow. These tumors are also known for being invasive, so detecting them early is important. As scary as “the big C” can be for pet owners, finding a lump or bump on your best fur friend doesn’t mean the end is near. It does mean, however, that you need to take immediate action to determine if the tumor is benign or malignant. Many skin tumors and cancers can be treated successfully if they are found early and removed completely during surgery. But you also need to know that a cure isn’t always possible: it depends on the tumor’s type, invasiveness, size and location. For cases where surgery is not an option, chemotherapy or radiation treatments may also be recommended. What you can do to help protect your pet from skin cancer? Do monthly nose-to-tail checks for lumps, bumps and scabs, and contact your veterinarian if you find any. Limit outdoor activities between 10 a.m. and 4 p.m. when ultraviolet (UV) rays are strongest. You and your dog may also appreciate longer walks in the early morning and evening when it’s cooler than midday. Install glare-reducing films with UV-filtering protection on windows where pets nap in the sun. Dress your pet in sun-safe clothing. 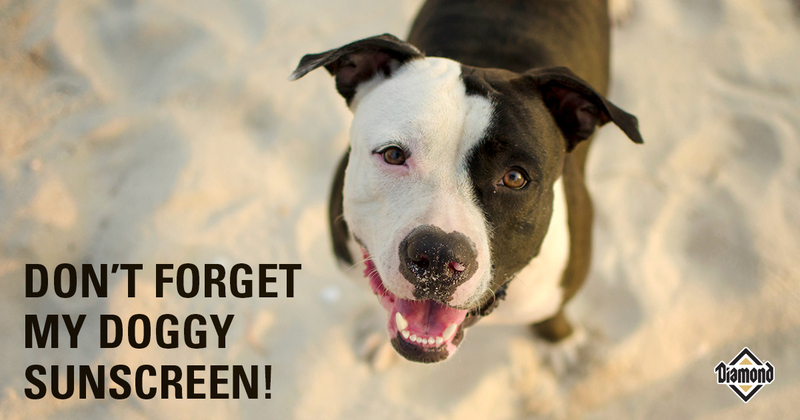 Apply the right sunscreen — to your dog as well as yourself. You’ll want a pet-specific sunscreen because human versions may contain ingredients, such as octisalate or homosalate, that can be dangerous to cats. Avoid close shaves if your pet is given a “summer cut.” Because fur offers some protection from the sun, maintain at least a half inch of fur on your pets. Your veterinarian is your best resource for questions about your pet’s health, including their skin. Ask your veterinarian to check any unusual lumps, bumps, growths or sores whenever you find one anywhere on your pet’s skin.